As January dwindles its way down into February, Bradford City find themselves squarely devoid of any hope of the play offs and the mindset of fans had begun to turn to ‘what is missing?’ from a squad that in recent weeks has come so close to the illusive victory too many times. Saturday’s game against Crewe at Valley Parade personified our home performances of late – maximum effort, but making things look more difficult than they seem to be. After gifting the visiting Crewe Alexandra side the opening goal – compliments of a weak Carl McHugh header – the Bantams successfully fought back to cover over the cracks of a lacklustre performance from the squad as a whole. Two goals down after 54 minutes, City rallied and got back on level terms through James Hanson and Gary Jones. Aaron McLean played a key part in both of these goals, laying the ball off for the onrushing player to finish on both occasions. There had been concerns surrounding the kind of role that McLean was to play in a side that had sold its star outlet striker, but if today’s game is anything to go by then we can be confident the strike partnership of Hanson and McLean will come good, once both of them have had time to establish just what their responsibilities are going forward. Originally, I was convinced that Hanson would continue to play the role of provider and ball-winner to McLean’s pace and finishing, but I would not be entirely shocked if McLean did his own share of creation on the ground. Hopefully the team will start to provide McLean with more passes to feet, as he clearly has a talent in holding the ball up as well as running onto it. One of the main concerns with our performances of late is the predictability of the game play. Too many times players have lost the impetus to play the ball forward and work it into the key positions, instead taking the default sacrificing of possession via a punt up field. When did we develop this fear of taking the game to the opposition and getting forward in numbers? Last year we had options all across the midfield, and now it seems that our only real challenger going forward is the eternally vibrant Gary Jones. Can you believe that the oldest player in the squad shows the most desire to get the job done? Jones has certainly put the boo-boys to bed with his last couple of performances at the Valley Parade – displays that both deserved the man of the match accolade. To this day, I ponder what might have been had McCall successfully signed him, as he’d certainly be the first name on my post-Premier League team sheet. After watching the quietest 60 minutes of my time watching Bradford City under the leadership of Phil Parkinson, the fans finally drummed up the atmosphere that has brought our team to life so many times before, following Jones’ first equaliser. It’s not entirely clear why the regular chanting was missing for large portions of the game, but I might speculate that the weather had something to do with that, and the struggling performance of the squad in the first half. The unrelenting bluster of the wind, and the fine rain that accompanied it, made for a bitterly cold setting and led to wayward passes from both sides. As the momentum built, City finally started flowing in attack. Unfortunately, Crewe were able to take full advantage of one such foray forward and catch us on the counter; 3 -2 with 78 minutes gone, a classy finish from their forward line. However, that was not to be the last act of this particular play and Jones was able to slot home from a very similar angle to his first. Special credit must be reserved for both goalkeepers, despite each conceding three goals, as they were both responsible for some of the best saves of the season. In particular, I was awestruck at the save from Ben Garratt late on, denying Hanson a headed goal that I was sure was destined to hit the back of the net. Jon McLaughlin also pulled off a great save to his bottom right to deny Chuks Aneke. End to end football ensued in the final minutes, but neither team was able to capitalise as the game fizzled out into yet another City stalemate at home to a bottom half of the table team. City continue to cling onto their mid-table status as the end-of-season run-in approaches, despite the recurrent squad mix-up due to injuries, suspensions and departures. There is little doubt that this group of individuals have a lot of potential when grouped together on a football field, all that remains is for them to transform regular draws into intermittent victories. I cannot foresee a dash to the play offs this season but, with the right groundwork set, I certainly wouldn’t rule it out for next year. Let’s hope that, in the summer, our best players are secured our mediocre players replaced – and that we will be in a much stronger position in 12 months’ time. ‘Fizzled out’ is not a term I’d apply to that game. I thought it was cracking entertainment in the 2nd half. Lurching from despair to elation is, to me, what football is all about. I left the ground reminded of why I love football so much. I hope you felt the same at the time and this is a ‘cold light of day’ perspective. To this very minute I still feel cheated. Whilst football is about entertainment from a ‘through the turnstiles’ mindset, it is also centred around success and achievement in league tables, cups and friendlies. On this occasion, I felt that the team should have taken three points against a struggling rival for survival and no amount of ‘hard-fought draw’ connoisseurs could convince me otherwise. Also, I felt cheated at full time. The only time that I I didn’t was between 2-2 and 2-3 on Saturday afternoon, when the chances of winning the game seemed highly likely. Stephen, I simply cannot agree with your use of the expression ‘maximum effort’ in last weekend’s game against Crewe. It was imo the proverbial ‘game of two halves’ with City palying with effort, desire and commitment in the last 45 minutes but showing very little of these attributes in the first 45 mins. We looked reticent, disjointed and uncomfortable in possession of the football. 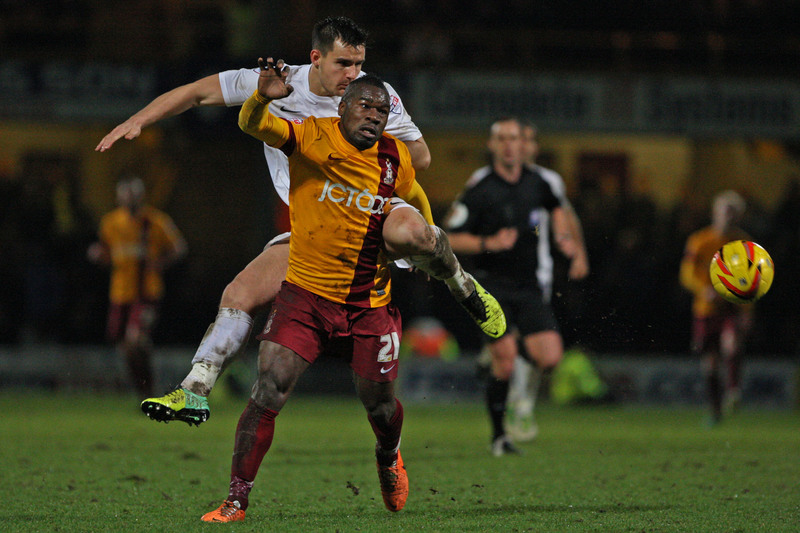 We didn’t look like the Bradford City we had seen earlier in the season. And that hardly suggests ‘maximum effort’ over the entirety of the game. Like you, at the end of the game, I also felt frustrated; frustrated that in the first half our team simply didn’t compete and didn’t adapt to the weather conditions as well as Crewe managed to do. And frustrated in the second half that despite the many chances we created, we simply didn’t have the composure in front of goal to turn good shooting and heading chances into those things which wins games … goals. We could and should have won the game against Crewe and we now need to make amends before we become embroiled at the wrong end of the table. ‘Not me Guv’, my original line referred to home performances as a cliché of ‘oh, so close’. I had simply allowed Jason to tweak the structure here and there to differentiate this piece from his own matchday report, which makes perfect sense when you think about it. It’s very true that we’re out of balance at the moment, and Jones’s goals might prove important with hindsight. Carlisle is a very important game now, but I still feel that Crewe was. Hopefully we’ll be coming away from the game with three points this time!